Chocolate chip cookie recipe from Instagram-famous Buttercream Bakeshop! 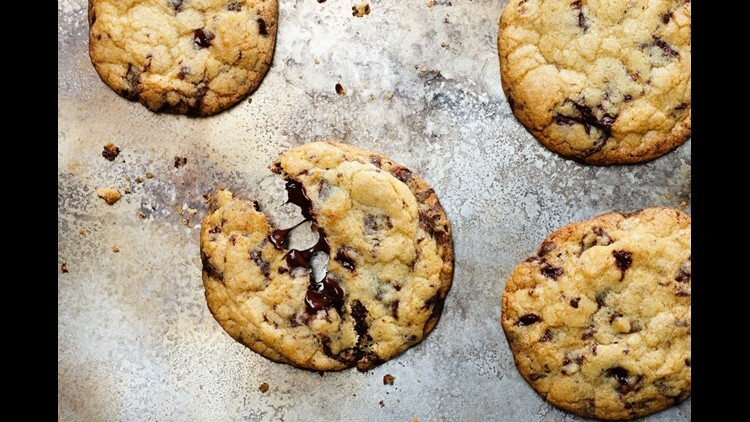 The ultimate chocolate chip cookie recipe from Buttercream Bakeshop is perfect for weekend fun! Place the butter and sugars into a bowl fitted with a paddle attachment and cream on a medium speed until the mixture is light smooth and light. This should take about 4 minutes. Scrape the bowl using a rubber spatula to make sure everything is mixed evenly. Alternatively you can also use a hand mixer. Combine the vanilla extract and eggs, adding the eggs one at a time, mixing fully after each addition. Scrape the bowl again. In a separate bowl combine flour, baking soda, baking powder, and salt. Add to the bowl of butter and eggs and mix until thoroughly combined. Add the chopped chocolate last, mixing it well. Divide the dough balls into 1-ounce pieces. It should make between 36-48 depending on how large the dough is portioned. Bake on a cookie sheet at 350 degrees Fahrenheit for 8-12 minutes, rotating the tray after the first 6.